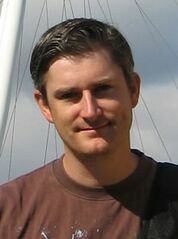 Jon Burton is a developer who worked on Traveller's Tales Sonic games such as Sonic 3D: Flickies' Island and Sonic R. In Sonic 3D he did the Program Design, Implementation, and Code Conversion and Product Management. For Sonic R he did Program Design & Implementation, Additional Artwork, and Special Effects Programming. He now runs the YouTube channel GameHut.